Natural history museum, originally uploaded by electra-cute. We both LOVE Museums and the Natural History museum in NYC has one of of the finest collections of dinosaur fossils we have ever seen. The first T REX ever unearthed is housed in this museum along with the rarest finds of a large specimin with SKIN on it..just a mind blowing exhibit all the way around. 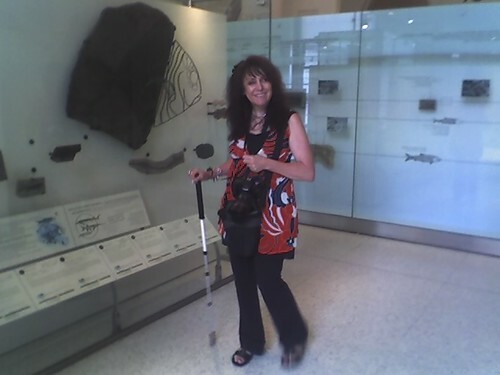 I’m standing next to one of the prehistoric fish skeletal displays. We spend about 3 hours here and I wish we had time to go back. We only touched on the museum but we have the Smithsonian left to go later this week. I think I’ll get my natural history fix there!! Hi mommy. This was just my camera and one lens. You should see my other camera bag I brought with . I’ll get a photo of it for ya!